Genetics: SLH is a zesty cross of Lemon Skunk and Super Silver Haze. It's 80% sativa, and 20% indica, so it's a sativa dominant hybrid. Super Lemon Haze was originally developed by Green House Seeds. Flavor and aroma: The aroma of this strain is of tangy, lemon citrus sweetness. Imagine lemon Skittles weed. That's the Super Lemon Haze aromatic experience. Effects: Super Lemon Haze infuses a happy, energized feeling into your spirit. The sativa/indica ratio produces a blend of uplifting, creativity energy; and a euphoric heady cerbral high. This is an excellent day/evening smoke for a good long lasting pick-me-up. Onset of effects can be delayed several minutes, as it is a bit of a creeper strain. Medicinal Uses: SLH is used for both its sativa, and indica qualities. Depression, fatigue, everyday stress, and general lethargy can be helped due to the burst of creative energy. Mild pain and headaches may be relieved, as well as nausea. 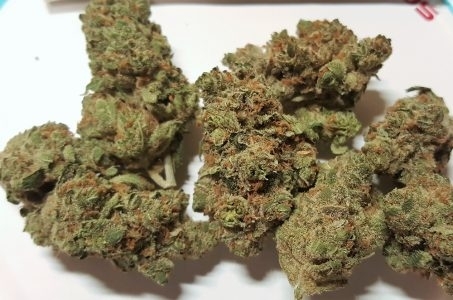 Please note that Super Lemon Haze may not be the best strain choice if a person is anxious or hyperactive; as the energy burst may be a bit too much. Potency: Our sample of fresh, citrus buds from Faragosi Farms in Trinidad, Colorado tested at 23.4% THC. While their is a hint of CBD, Super Lemon Haze is not recommended for those looking for a high CBD strain. Grow Info: This hybrid can have a tendency to grow tall and possibly lanky. Yields are average to slightly above average, and a finish time of about 9 - 10 weeks. Smooth citrus taste. Slight sharpness on inhale. Even transitioning high .